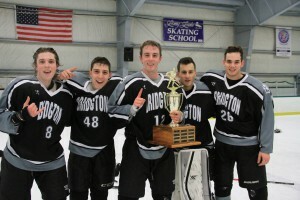 With a legacy that includes a 2011 National Championship, Bridgton Academy’s hockey program is uniquely suited to prepare the right aspiring hockey player for the next level. We skate at our own arena, and are on-ice from the day our students arrive on campus, where we prepare to face a schedule of some of the top Junior and Prep School programs in New England and Canada. Our coaches are focused on preparing our teams for not only their next opportunity on the ice, but also in the classroom and on campus, our specialized, individualized training programs make sure that we are making the most of your year at Bridgton. Our hockey players have gone on to successful careers at The United States Military Academy (West Point), Southern New Hampshire University, Assumption College, Stonehill College, Saint Michael’s College, St. Anselm College, and such Division I Club Hockey Teams as The University of Oregon, University of Arizona, The Ohio State University, and the University of Rhode Island. Our 50-game Junior schedule features some of the top competition in the Northeast and Canada. • Exposure to over 300 colleges and universities within New England. • On Campus Ice Arena, college-style locker room. • Daily Team Practice, private skill instruction during off periods. • Year round sport specific off-ice conditioning program. • Game analysis and individual player edits via video software.